I've always loved typing games. My favorite is Ztype, which you can play directly in your browser. It's a little sad how many hours I've spent playing this game. Mario Typer, a simple PC game I made in a weekend for my Computer Graphics course at AIT-Budapest, is heavily inspired by Ztype, as well as the cult classic Super Mario 64, obviously. Nintendo, if you're reading this, please don't sue me! Phew, now that they've left, I can give you the lowdown. The concept of Mario Typer is pretty simple. 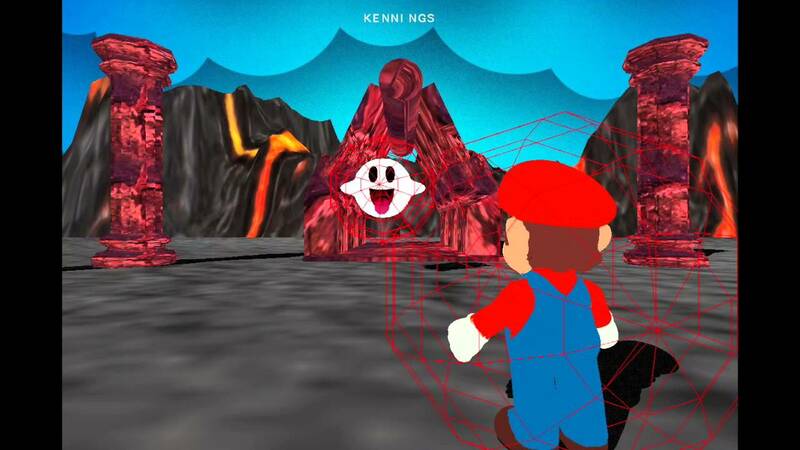 You play as Mario, who remains centered between 4 Boo portals. When the game starts, Boos (the not-so-friendly white ghosts) start to pseudo-randomly emerge from any or all of the 4 portals and fly toward Mario. As Mario, you must constantly watch your back by turning around with the arrow keys to face the Boos in combat. Your goal is to type the word above each Boo in order to throw a fireball at it and kill it before it gets to you! Sounds easy enough, but beware: as the game progresses, Boos begin to emerge more frequently and fly more quickly, and the words get longer. Lastly, Mario Typer, unlike Ztype, is in 3D! That's right: I've added a whole 'nother dimension, making my game at least 1.4 times as fun to play as Ztype. In all seriousness, the 3D rendering in this game was pretty much plug-and-play, since the code that renders the 3D models was written by someone else and given to us openly by the professor in a handy-dandy "black box" rendering library consisting of 3-4 C++ files. I know, disappointing, I got to skip all the actual hard stuff... Weeeelll actually, not quite. I actually read and modified a bunch of the code in this library. "Why? ", you may ask. After all, doing so was way beyond the requirements of the project. Well, as you may already suspect, I found a major bug in the library and decided I should fix it myself. The bug in the code came to my attention because, although it was not required, I wanted to use custom .OBJ files downloaded from the internet, like Mario! The professors lovingly provided us with a couple .OBJ files of Tigger and a Honey Pot, but I wanted to be a little more creative. It was not long before I realized that most of the .OBJ files I downloaded caused the game to crash with an EXC_BAD_ACCESS error in the Mesh.cpp file (one of the files included in the library), whereas the Tigger and Honeypot .OBJ files worked flawlessly. However, after successfully opening the Mario.OBJ file in Blender, I knew the ones I downloaded were not corrupt. So, as any good programmer would, I dove head-first into the Mesh.cpp file, simply because I knew it was responsible for creating 3D meshes from .OBJ files. After about 3 hours of work, not only did I determine the bugs in the original source code I was provided, but I also rewrote the code to work for any .OBJ file, even those downloaded from the internet. I also made the code much more human-readable, yay for comments! Lines that start with v are vertices. Lines that start with vn are vertex normals. Lines that start with vt are texture coordinates. Lines that start with f are faces. Faces are defined using lists of vertex, texture and normal indices. Each item in the list usually comes in the format %d/%d/%d (position/texture/normal), as you can see in the example I gave above. However, it's a bad idea to assume that this will always be the case, which is exactly the mistake that was made in the original code of the Mesh.cpp file. In actuality, it's not uncommon for faces to be described without a value for the texture index or for the normal index, so they can look like this: %d/%d (position/texture), or like this: %d//%d (position//normal), and the .OBJ file will still be completely valid. Moreover, different faces in the same .OBJ file can use different formats. Even though it's nice to know about textures and normal vectors, this information is not required to simply define a face. Besides, giving texture and normal indices for every face would be quite redundant in some cases, especially if the texture mapping is less detailed than the mesh. This was the first order of business when I was correcting the mistakes in the code. The other incorrect assumption made by the Mesh.cpp file, though far less fatal, was that faces would always have either 3 or 4 components in the list of vertex, texture, and normal indices. In other words, it assumed that faces are always either triangles or quadrilaterals (quads). But, you see, much like dinosaurs, .OBJ files come in all different shapes and sizes. The 3D objects they represent can be made up of triangles, quads, and, while uncommon, even higher-order polygons like pentagons. So, just for fun, I made sure .OBJ files with pentagonal faces could also be successfully rendered from the code. Good luck finding a mesh that uses them, though. If you're interested, you can view the old code, and the changes I made to it, in the github repo linked below. The old file is aptly named Mesh-old.cpp. Have anything to add? I left out some of the details of .OBJ's on purpose, but if you think there's something important I forgot to mention, please let me know in the comments. Want updates on the stuff I do? Thank you! Please check and verify your email.